SEO Summit 2014: A Huge Success! | TrueLogic Online Solutions, Inc.
SEO Summit 2014: A Huge Success! The line-up of speakers was great and personally, I have been an avid follower of these three guys for a while. Jason Acidre – The inbound marketer famous for his creative / out of this world link acquisition methodologies and a blog that could be re-branded to a Google Link Building guide! He is CEO of Xight Interactive and author of Kaiserthesage.com. Benj Arriola – The SEO legend and winner of multiple international SEO competitions. He is VP over at Internet Marketing Inc.
Sean Si – The overall entrepreneur, sales and SEO hacker who never fails to inspire and motivate people from different backgrounds. He is a motivational and leadership speaker as well as CEO of SEO-Hacker.com. Yesterday was my first time seeing and hearing Jason speak at a conference and I gotta tell you, with the right understanding, questions and will power to learn, you’ll find a bunch of hidden gems in his presentation. It’s as if you are doing a one-on-one with the guy and it has a more personal experience attached to it. Guest posting at the right places. Popular news outlets and blogs have sources, question is, who are they? In a private discussion I had with Jason, he mentioned that to find the sources, it’s only a matter of using search operators and looking at file structures in URLs. Really clever trick and is incredibly easy to do. Don’t complicate things. Simplifying processes is the best and only way to go. If you haven’t heard of Jason, I highly recommend that you check him out at kaiserthesage.com and attend his talks. Amazing guy, link builder, inbound marketer and SEO. As I mentioned earlier, Benj won a few international contests and these aren’t just any contests, they’re like those raffles you join that you know out of millions of people, there’s no chance whatsoever for you to win. In Benj’s case, he won– not just once, but a few times. Benj is the most interesting internet marketer that I have ever had the chance to meet and listen to. His excellent visuals and structure of how he presents his deck is right on dot and it’s never a dull moment. Benj talked about his journey as a web developer from blackhat to whitehat. Now, remember when Sean Si said “Secrets that they (Jason, Benj and Sean) don’t usually blog about”? Benj took that and ran with it. He showed us his crazy journey on how he won some of the contests one after the other, it was the most creative link building (although considered to be black hat nowadays) I have EVER heard of. His background in development came really handy on each of the competitions. I won’t go into detail about it but let’s just say that at one point, wordpress (Yes, THE wordpress) banned him from using their platform. You’re probably thinking how he managed to do that– well, it’s a perk of going to this conference. So make sure you go to the next one. If you were a beginner SEO practitioner, his talk (even the blackhat portion) would have given you so much clarity on what the industry is all about. It’s never too late to learn. As long as there is a will and you are motivated, you can do it. Benj started as a QA Chemist. Think about that for a second. Link building is all about creativity. No matter what vertical you are in, there WILL be something that interests people. Not to use any of his old techniques that he talked about. Benj defines that clear line between loving what you do and doing what you do. Mr. Arriola does not practice blackhat techniques today and never uses it for client purposes. This was only used back when search algorithms were different. I first heard about Sean through search, of course. And ever since then, I was a big fan and avid reader of SEO-Hacker. It’s amazing to see how much SEO-Hacker has grown and developed their brand throughout the years. I had the opportunity to meet Sean after the event and for those that don’t know him, he is the most humble and down to earth guy. He is a Christian and a very nice guy. He is the type of guy that has a gift in motivating and inspiring. A true leader. His talk was a good compliment to Benj and Jason’s. He gave an in-depth look into business development and how the SEO-Hacker team grew their brand. Don’t do content marketing for SEO. Do SEO FOR content marketing. Sean provided insight into so many questions that the audience had. Sean also mentioned that this would be an annual event, to grow the SEO and Marketing community here in the Philippines. So look out for next years SEO Summit and be sure to go! The entire event was a great display of expertise and collaboration. The fact that all proceeds help a child in need is worth every penny. The learning and knowledge that was shared that day was priceless. I look forward to SEO Summit 2015! See you all there! 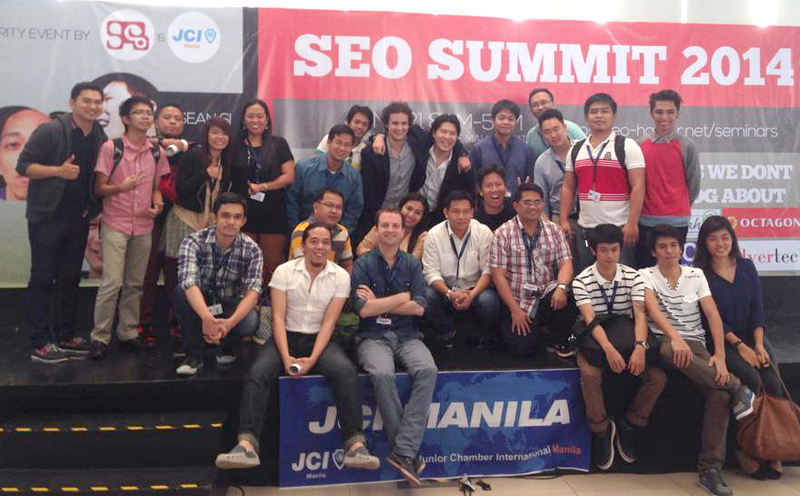 The entire SEO Summit was brought to all of us by Sean from SEO-Hacker and JCI Manila. I’d like to congratulate SEO-Hacker and Sean Si for organizing this Charity event full of intelligent people and its huge success! We at TrueLogic are looking forward to more amazing things! https://www.truelogic.com.ph/wp-content/uploads/2014/06/SEOSummit.jpg 549 885 Marc Samson https://www.truelogic.com.ph/wp-content/uploads/2018/03/Truelogic-Logo-Colored.png Marc Samson2014-06-23 12:54:502016-10-19 15:01:59SEO Summit 2014: A Huge Success!